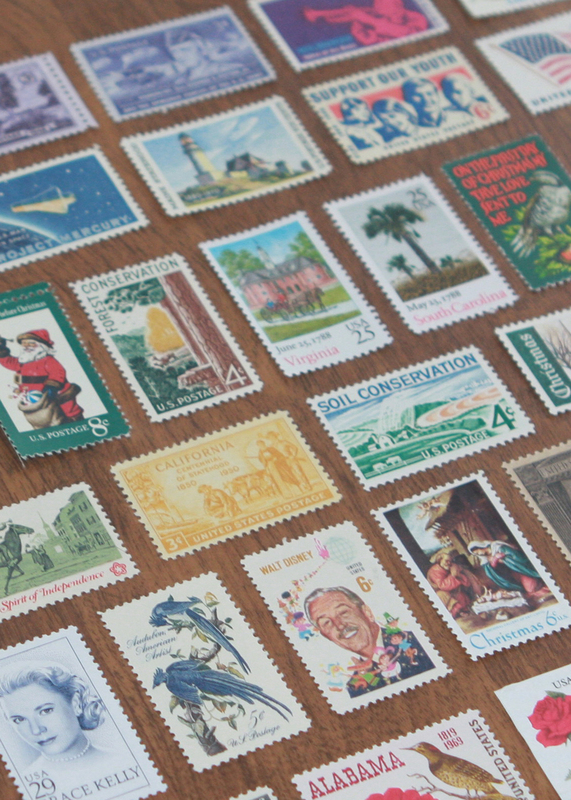 Earlier this year, I ordered some vintage stamps for inspiration. I love the detail poured into each one, and the colors are so fun. Plus, it's really amazing how many people, organizations, causes and moments have been commemorated by the United States Post Office! Gerald & Joan is proud to debut our 2014 Christmas card collection. Inspired by magical childhood memories and cherished family traditions, each design mixes vintage and modern touches to create holiday greetings that are sure to warm hearts of all ages. Pricing includes customization, production and printing. Standard white envelopes are included with each order. Place your order now to ensure your precious holiday memories will be delivered in time for Christmas! Shipping, handling and tax not included. Pricing for premium envelopes shown is available upon request. For questions, comments or to place your custom Christmas Card order, please click here. To view the entire collection in full, click here. Ever since we bought our first house almost six years ago, we wanted to create a family gallery wall. The wall never materialized at our first house, but it was at the top of our to-do list when we moved into our new house at the end of August. 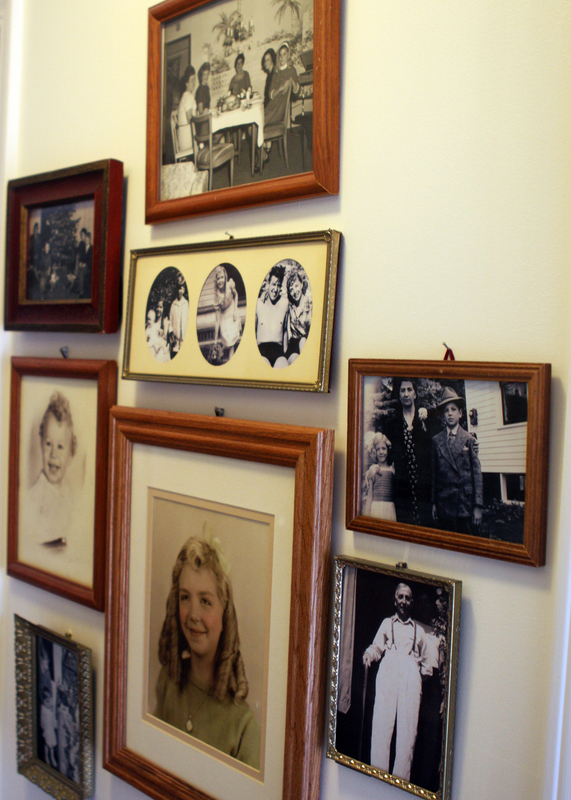 This gallery wall is in our downstairs hallway, right in the center of our house. We're still on the hunt for photos and frames for it, but I wanted to share it as a work in progress. In time, we plan to add two more gallery walls going up our staircase and in our upstairs hallway. Jonathan's side of the family isn't well represented on the wall, but we'll have some of his family photos (and the stories that go along with them) to hang and share very soon. Once we have those photos, I'll take down most of the photos that are less than 30 years old. While the photos are definitely the stars of the show, the frames are pretty fun as well. Some of them have been in my family for decades, and others came from the local Habitat for Humanity ReStore for a dollar or two each. I think the mix of intricate and plain strikes a nice balance. There are also some empty spaces for additional frames because I like the idea of adding to the wall as we find interesting frames and/or locate photos that are special to us. Some of the photos shown here will be familiar to you. Several of them were scanned from film slides and printed by me. We love having these precious memories (and people) around us everyday. For the past year, Palos Verdes, California (and the South Bay area in general) has been recurring theme on this blog (the most recent post was this one). PV was my family's home from 1960 to 1973. When my great-grandmother Elsie passed away in 1973, she asked that the house be sold and that her ashes be spread over the Pacific Ocean near PV. Her three children respected those wishes. Both of her daughters remained in California, but neither one lived in Palos Verdes again. As a child, I don't remember visiting PV very much. I think the first trip we made up the peninsula was in 1994, but I remember that it had a huge impact on me. I wanted to visit PV during every vacation, but I think we only visited one or two other times before Joan's death in 2003. After our first California vacation together in 2005, Jonathan and I began spending more time in the South Bay area, and our day trips to PV became highlights. The combination of the natural beauty of the coastline and the pristine mid-century California homes captured our hearts. After scanning so many film slides over the past few months, it became clear to me that we are drawn there for other reasons as well. It is part of our history and our family's story. La Venta Inn in Palos Verdes, California around 1960. Palos Verdes, California circa 1960. Elsie's home in Palos Verdes, circa 1960. A view of the South Bay - Redondo, Hermosa and Manhattan Beaches -- from Palos Verdes, circa 1960. Elsie at the beach, circa 1960. Looking up the hill from Elsie's backyard, circa 1960. Beautiful mid-century Palos Verdes homes, circa 1960. A view of Elsie's backyard in Palos Verdes, taken around 1960. Another view of the South Bay, taken around 1960. Malaga Cove Plaza, circa 1960. And just for fun...a recent shot of the same fountain! Also in Malaga Cove Plaza was the Palos Verdes General Store, circa 1960. Here's the same building in recent years. A view of La Venta Inn, looking down over Elsie's house, circa 1960. Me and Jonathan in that same spot on our first trip to PV together in 2005. Elsie's house is to our right with the skylight. All of the above images from 1960 are from our family's film archives and were scanned and converted to digital images by Gerald and Joan. If you are interested in having us scan and preserve your family's film slides or images, contact us here. The recent images of California were taken by my mother.